Located in a busy commercial area of Marbella this centre is very close to the Marbella Conference and Exhibition centre as well as all major banks, shops, restaurants and hotels. There are parks and beaches within walking distance providing spectacular views of the La Concha Mountain. The area is well located for access to the motorway systems and the Malaga and Gibraltar airports which are approximately 45 minutes’ drive from the centre. This business centre is located in one of the most exclusive areas of the Costa del Sol, close to restaurants, cafes and more. The centre offers a comfortable and efficient workspace solution, ideal for a number of business types and sizes. There is a number of nearby conference centres and events spaces. There are also meeting rooms at the centre so you can convene collaborative projects with ease. In the heart of Marbella, with 3250 square ft of shared and private workspace solutions, your business will thank you for this prestigious address. It has excellent facilities, from support services, to meeting rooms and high-speed internet. There is also a kitchen where you can recharge. The centre is accessible 24 hours a day, allowing you to work through any hour your business requires. It has a refreshing, pleasant and comfortable atmosphere. Surrounded by restaurants and delicious eateries on the Milla de Oro this boutique office space is just 10 minutes from the centre of Marbella and five from Puerto Banus. The ideal for a good work / life balance as the beach is just a three-minute walk. Private offices have between two and five desks while meeting rooms and fixed and flexible hot-desks are also available. Commuting to the space is easy and the bus stop is also just a three-minute walk away. Due to its agreeable climate the Costa del Sol is one of the major tourist destinations worldwide. This centre is located in the Puerto Banus yachting harbour in one the best business areas of Marbella allowing clients to benefit from all the great restaurants, cafés and hotels close by. 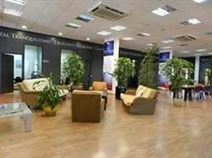 These prestigious office spaces were opened in 2004 and have been designed to give clients a comfortable working environment and considerable flexibility; the centre is equipped with modern technology and offers a range facilities.